In a move unprecedented in modern American history, the president is providing cover for Nazis and white nationalists. 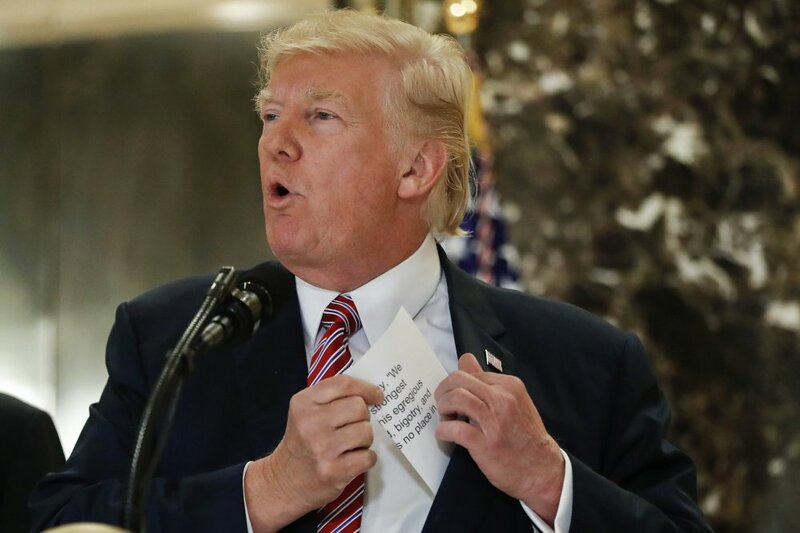 At a press conference Tuesday, one day after reading off a teleprompter a canned and insincere refutation of white nationalism, President Donald Trump showed us what he really thinks. Speaking extemporaneously, Trump more strongly repeated his initial claim that blame for the violence in Charlottesville was on “both sides,” as if who is in the right, the Nazis calling for a racially pure country or those who oppose them in the name of true American values, is up for discussion. In doing so, he also drove a wedge between Americans already uneasy with each other — those who reasonably disagree on the future of Confederate monuments. It’s hard enough for the two sides to understand each other without confusing the matter with groups representing our worst impulses. Trump’s only defense is that his purpose in making the remarks was not to comment on race relations, but to stand up to those he sees as his enemies. The only conviction he has is that he is right, and that those that praise him are praiseworthy in return. At the Tuesday press conference, he wasn’t trying to make a point about the complexity of race and memory in the South — he doesn’t have the knowledge of American history nor the grasp of the role of the presidency nor the empathy to even attempt that. Instead, he was rewarding the loyalty of people who support him — without regard to their heinous views — and lashing out at what he sees as the media’s unfair treatment. It’s not black vs. white; it’s people who like him vs. people who don’t. But whether he believes the rubbish he spouted Tuesday or not, the end result is the same. The neo-Nazis once relegated to the shadows — and all the young white men considering that path — heard loud and clear that they are onto something, that their view of the world deserves a place in the debate. It doesn’t. That should go without saying — and until very recently it did. We can fight over what it means to commemorate the Confederacy, and whether statues are appropriate. We can — and should — talk openly and think critically about the Founding Fathers’ history with slavery, and what that means for the story of America. We can debate immigration and police brutality and institutional racism, as long as we are honest about our respective biases and blindspots. But we can’t abide leaders who purposely or through ego and weakness of character use those issues to divide us. Trump didn’t invent racism or bigotry, but he is certainly exploiting them. As a result, we’ll have more late-night torch-lit marches, more arm-banded outcasts enjoying their time in the spotlight, more Americans wondering if the chasm between them and those with different views can ever be breached. That is not the country we should want to be.